Before leaving for our trip to the continent, I toyed with the idea of writing a book about what people in each country eat for breakfast. I don’t know exactly why what people eat for breakfast is a curiosity to me but it has been for some time. There is the whole ‘breakfast is the most important meal of the day’ thing but I’m not sure that’s it. It could go back to almost twenty years ago on my first trip out of the country. I ventured to Iceland with a friend and I found breakfast was exciting in other countries! There was skyr (a creamy yogurt type of concoction)! delicious brown breads! and herring! I thought South America was going to be full of exciting revelations too. But after traveling for over two years here, I have to tell you that sadly there just isn’t enough material to write a whole book on the subject. Even more disappointing, I found the breakfast in each country to be very basic. Breakfast, as it turns out, is not the most celebrated meal of the day for the majority of people living on this continent. Desayuno (breakfast in Spanish) was one of the first vocabulary words I learned and I was saddened it wasn’t a celebrated affair. Of course it varies by country but overall, lunch seems to be the main meal and the real star of the day. Instead of writing a book, I thought to write this post about the subject instead. I know what you may be thinking. Why even bother writing about this subject at all if I am setting you up for possible boredom? Well, even though I was overall disappointed with the breakfasts in South America, I still find it intriguing to think of what people around the world are eating first thing in the morning and maybe you are wondering too. Small revelations about each culture often relate to the bigger picture. Even better, if you are visiting the continent and are pondering what you might be getting for breakfast, then keep reading! I hate playing favorites but there is no doubt that Brazil has the best and most interesting breakfast and Argentina just has the worst (although I am partial to their dulce de leche). It’s taken me a while to get used to the concept of such a small breakfast and a large lunch but I think I have finally adjusted. In the United States, breakfast is viewed as an important meal (some touting it as the most important meal of the day). In South America, generally speaking, it’s just an afterthought. Lets take a look at the breakfast country by country and also what locals eat vs what you will be served in your hostel. Way back when, in October of 2012, we started our journey in South America in Buenos Aires, Argentina. This being a cosmopolitan city with a strong cafe culture, you can do very well with breakfast in one of the nicer cafes but you will pay dearly for it. The most typical breakfast is a cup of coffee (usually instant and with pre-added sugar) with milk (cafe con leche). This is served with medialunas or bread and usually some dulce de leche and butter/jam on the side. Medialunas translate into half moons and indeed, these croissant-shaped pastries resemble the moon at its half stage. However, don’t be fooled into thinking these are the same as croissants that you know and love (like my poor French boyfriend did initially). The dough is not nearly as buttery and is much more bready. In addition, they often cover the medialuna in a sugary coating (totally unnecessary). But generally you will have a choice: with or without the sugary coating. Even though they aren’t the same as croissants, medialunas-provided they are made fresh, certainly make a tasty breakfast. Outside of the fine cafes in Buenos Aires, where your coffee will be real and strong, and your medialuna fresh and soft and your bill will be as high as the quality, don’t expect much. In hostels, medialunas are normally served day (or even two) old, rendering them rather hard and stale. Even the delicious dulce de leche spread can’t save it. Dulce de leche is similar to caramel but creamier and much more addicting and delicious. I’m convinced Argentina makes the best in the world. 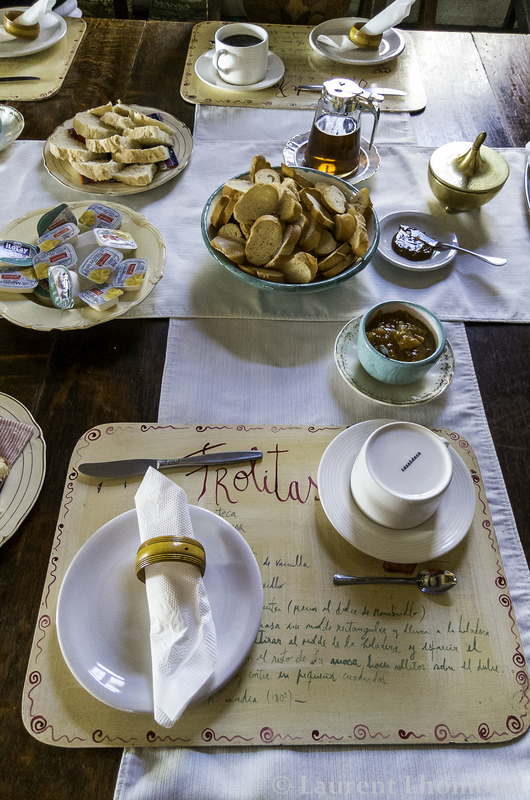 You can find it on the table at almost every Argentine breakfast. They even have individual tubs-like the kind you normally find jam or butter (at a diner or restaurant) in! The best kinds are made simply with milk and sugar (goats milk makes an especially delicious version) and stirred all day with a wooden spoon. Dulce de leche differs greatly from other countries where you find ‘manjar’ or ‘arequipe’. Those are made with sweetened condensed milk, quicker cooking times and have a totally different flavor. Even though many Argentinians drink coffee in the morning, this is not a country for good coffee (Buenos Aires the already mentioned exception). In the supermarket you are faced with mostly instant brands and every one of them has sugar listed as an ingredient! We did find pre-ground beans but sugar was even added to them too! Whole beans for sale in the supermarket are non-existent. 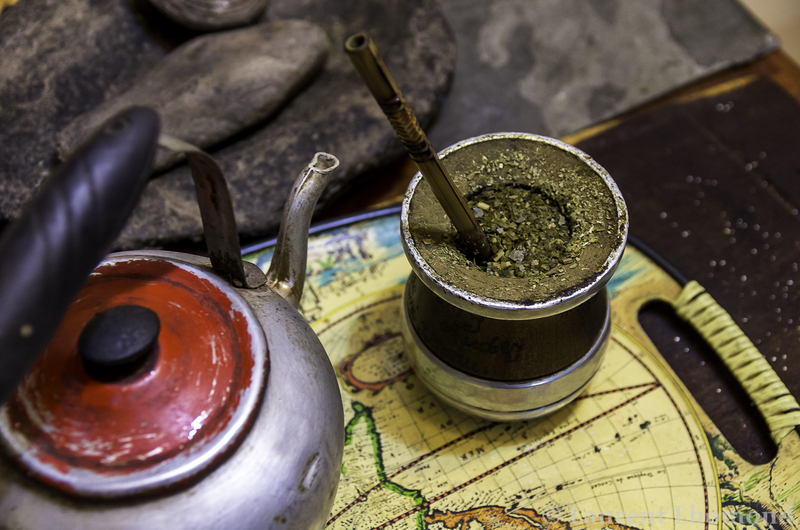 In Argentina, they drink a lot of mate (a hot (but not boiling!) 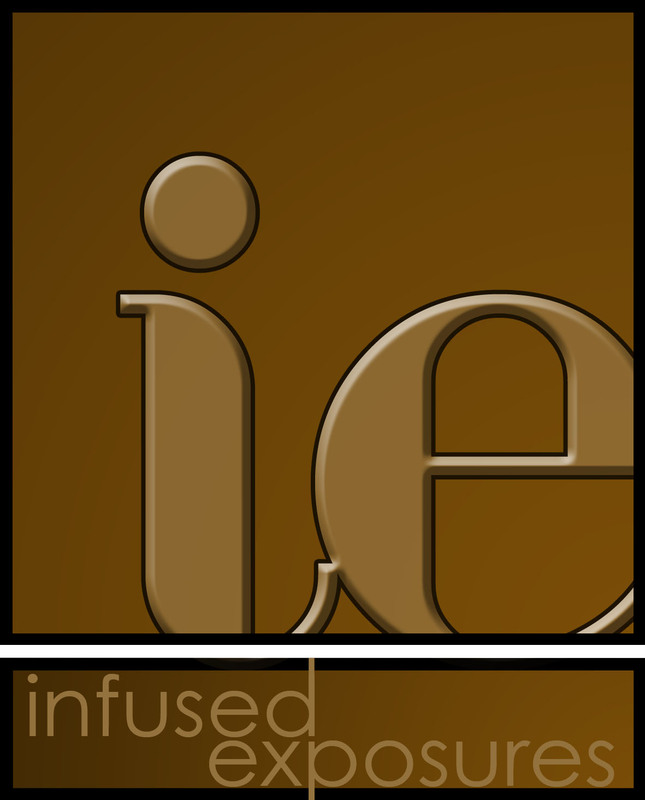 beverage made from the dried leaves of yerba mate) and the brands you find here are some of the best in the world. They really know their mate and even though many Argentines start sipping it first thing in the morning, it is drank throughout the day. It’s not just a drink of tea, it’s an important part of the culture here and widespread social ritual. I stopped drinking coffee in Argentina and switched to mate for my time there. To avoid disappointment on a morning to morning basis, I advise you to do the same. When in Rome…. If you are staying in a very cheap hostel, you probably won’t even be offered medialunas but instead just bread. Bad bread. Sometimes the bread is crusty crostini bread that’s usually been left out so it has the texture of a rock. The bread everywhere is of poor quality, generally speaking. 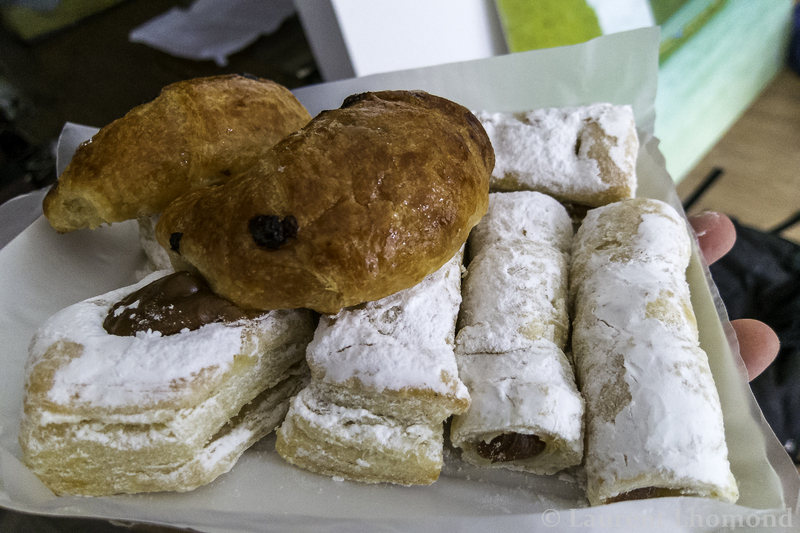 I find it a real shame because bakeries (called panaderias) in Argentina offer up some absolutely delectable pastries that go by the unfortunate name, facturas. These are normally not eaten for breakfast but instead around 4-6 pm in what is known as a merienda. The merienda is an interesting tradition brought over from Spain and it is not only something to hold you over until dinner but just like many things in Argentina, it carries a strong social component too. Friends gather together, to drink cortados, cafe con leche or the ubiquitous mate and eat facturas during the merienda. Dinner is served so late in Argentina, just like in Spain. Typical dinners don’t start until after 9 pm and going out for dinner at 11 pm is totally normal-even if you have young kids! I can remember my stomach rumbling waiting for the restaurants to open at 9 only to finally enter and be the only gringo inside. In between lunch and waiting forever for 11 pm to roll around people get hungry! And so the merienda exists. I loved it! Most of the facturas are stuffed with dulce de leche (even the ones that don’t have it overtly dripping out usually have it hidden inside, tucked under something). Being a huge lover of dulce de leche, I could never decide which one to eat! Summary: Argentines will either have a coffee (often a cortado-an espresso with a little milk) or mate paired with some bread (often a medialuna) and almost always slathered with dulce de leche or a little butter and jam. If you are staying in the hostels you will typically receive coffee so bad that you will wish it was instant or it will just be instant-in which case you should rejoice that they didn’t attempt a drip. Mate will NOT usually be offered, except in tea bag form in which case it really isn’t mate at all. Some hostels will actually offer a communal gourd, loose mate and a bombilla (metal straw with filter) but this is more the exception than the rule. In a cheap hostel, you will get day old bread and some terrible jam, butter and cheap dulce de leche. The better hostels will have medialunas and more passable bread with a higher quality dulce de leche. Chile was the second country we visited. We found the breakfast a step above Argentina (a small step but a step nonetheless). There was a bit (and I do mean just a tiny bit) more variety. The meal set up is largely similar. Breakfast is small, lunch is the main meal, there is an early evening (typically around the same time as the merienda) snack called an once (pronounced own-say) and dinner is a small affair served around 9. Sometimes dinner is skipped entirely in favor of a larger once. 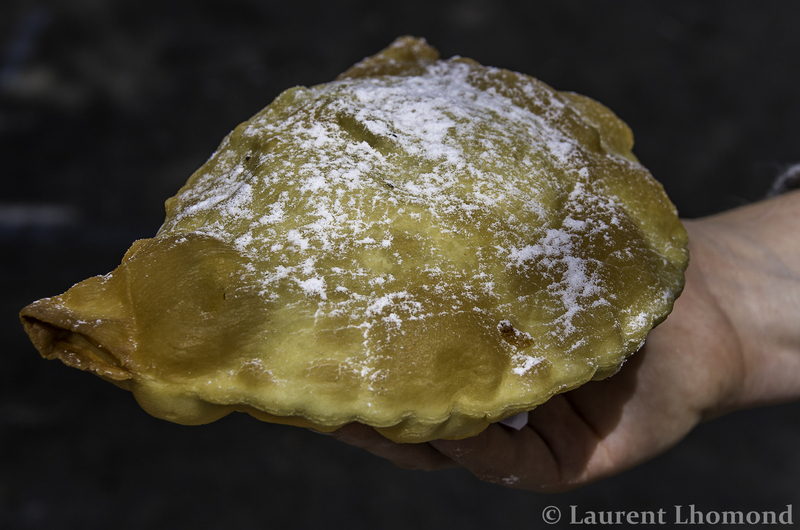 Once’s are a chance for Chileans to indulge in sweets or sometimes it can be savory too in the form of empanadas, the beloved steak or ham and cheese sandwich (Barros Luco or Jarpa) and sometimes a sopaipilla. For breakfast, bread is served with something. And by something I mean butter, jam, manjar (a poorer cousin of dulce de leche) or avocado with cheese or ham. The jam is better here too. In Patagonia, homemade jam from blackberries is blessedly common. Even further up north we found a lot of homemade jams. I found the bread in Chile to be a step above Argentina (and I mean another small step here). The coffee is just as disappointing and you often get a powdery instant type. Nescafe in this country is really translated to ‘No es cafe’ (It’s not coffee). As is true in Argentina, if you do get an attempt at drip you will be begging for instant. Mate is not so widespread here, save for the south in Patagonia. Tea bags are ubiquitous with brands like yellow Lipton being very popular. Chileans love their tea. You can also get some nice herbal teas with flavors like cedron (nice lemony flavor), baldo (great for an upset stomach) or manzanilla (chammomile). In Chile, I suffered. Mate wasn’t so widespread so I usually ended up drinking the instant coffee. I know, I know….Eventually I wised up an started drinking a brand of ceylon tea called Emblem. Pretty good. In the mornings, Chileans will usually pick up some fresh bread (like the hero-shaped marraqueta or the flat, pancake-ish and richer hallullas. 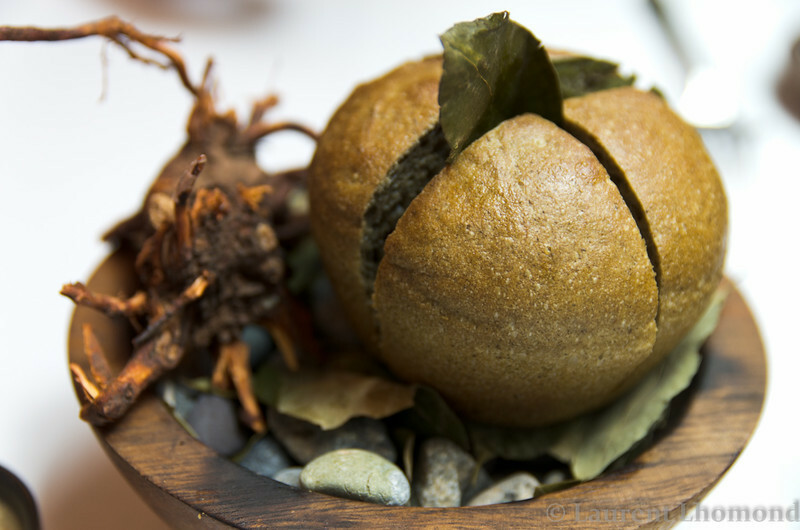 In Patagonia, the bread is always homemade and referred to as pan amasado. It’s dense but good. If using the marraqueta, Chileans sometimes take out the insides (I have no idea why but I witnessed this on several occasions-perhaps to make room for more avocado?) and fill it with smashed avocado mixed with a little bit of oil and salt. Cheese or ham is sometimes added and coffee or tea drank alongside it. Avocados are huge in Chile and delicious! This breakfast along with a mug of black tea, is the best way to go. 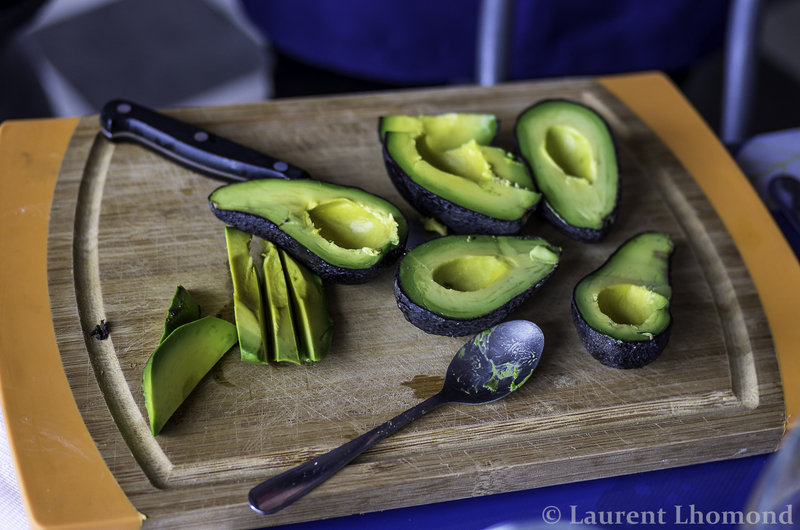 In the hostels, you probably, unfortunately, won’t get the avocado. Instead the table will be filled with jams, manjar or butter. Marraquetas or hallullas will be present. Instant coffee and a selection of tea will round out the meal. If you are very lucky, there will be cold cuts offered (usually ham and/or cheese) and maybe some yogurt or cereal. Just like Argentina, no juice-or if there is one, it will be one made from powder. 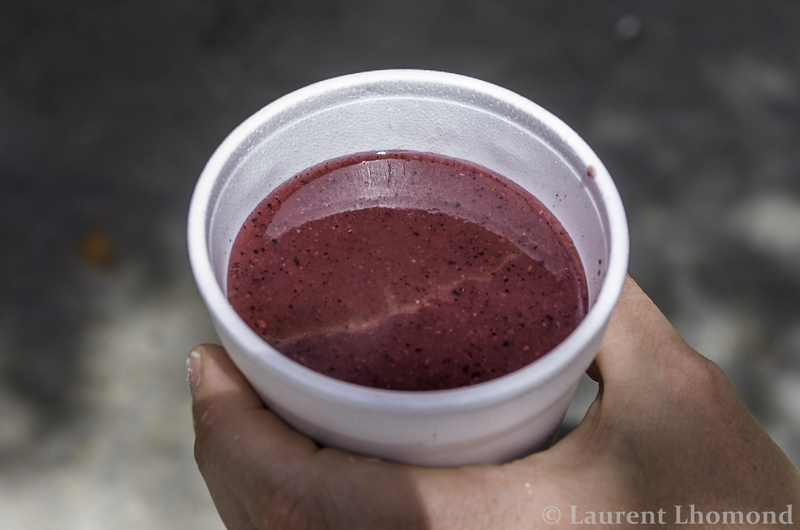 I never understood why Chileans aren’t into fresh juice in the morning as much as Peruvians, Bolivians or Colombians. Unlike Argentina, they have great fruits in Chile! It’s just not in the culture. If you are in Santiago, your breakfast choices will increase and with the recent growth of coffee shops, it is now possible to get very decent coffee. Try Colmado Bakery and Cafe for a real cup if you happen to be in the area. Outside of the capital, with the exception of Valparaiso, you are more hard pressed. Summary: Chileans will typically eat their bread with avocado or ham or cheese or all three. Sometimes with butter and jam or manjar too. Coffee is another dismal affair. Stick to tea bags or learn to live with it. After all Chile is a beautiful and amazing country. We can overlook the no es cafe, Nescafe. In hostels, expect the same as above minus the avocado and considering it lucky if you see meat/cheese. Bolivia was a serious step up from Argentina and Chile in terms of breakfast. Eggs made their way back onto our plate! Fresh squeezed orange juice was widespread! The bread, especially in and around La Paz was actually crusty! Fresh fruit juices were really common and cheap! These things were very exciting. But the excitement stopped at the hot beverage on offer-more dismal coffee. Drip coffee was prevalent rather than our previous encounters with widespread Nescafe but I was almost wishing for the little granules. Yes, the drip coffee was that bad. Restaurants were a step above the hostel offers. Cafe con leche seems to be a popular choice with the emphasis on the leche part. I quickly learned my lesson in not only Bolivia but most of the continent. Cafe con leche really should be called Leche con cafe. I was horrified the first time they came and poured it for me-barely filling the cup halfway with coffee and topping the whole thing off with milk. As someone who occasionally enjoys milk in their coffee, I usually just put a splash. I don’t want to see clouds in my coffee, despite that great song. Unless you like your coffee white, beware of cafe con leche! Black tea is available too, although the Brits might scoff at what’s on offer. More common is coca tea or just plain, dried coca leaves to make a tea yourself or stuff into your cheek. Yes, it’s the same coca leaves that are used to make cocaine (although it takes buckets and buckets of leaves to make cocaine along with gasoline, kerosene or diesel fuels & some chemicals). I recently saw on the news that Pope Francis was criticized during his recent visit to Bolivia for chewing the leaves! Come on now, people. The leaves are said to help with altitude sickness and since he was in the capital, La Paz (altitude just over 10,000 ft), what’s the harm in having some tea? I chewed the leaves and drank the tea but still can’t claim if the leaves will keep altitude sickness at bay but it’s worth a try. I never understood why people think chewing coca leaves or drinking the tea is controversial in any way, shape or form. The coca leaves are extremely important in Bolivian culture and you will likely see many people with one side of their cheek puffed out while chewing the leaves. The traditions go far back and having nothing to do with putting cocaine up your nose! Bolivians also eat lunch as their big meal of the day. In Cochabamba, they eat breakfast, a snack around 10, lunch another snack around 5 and dinner! It’s said that the people from Cochabamba eat all day long and it’s pretty true! The 10 am snack is very common throughout the country. 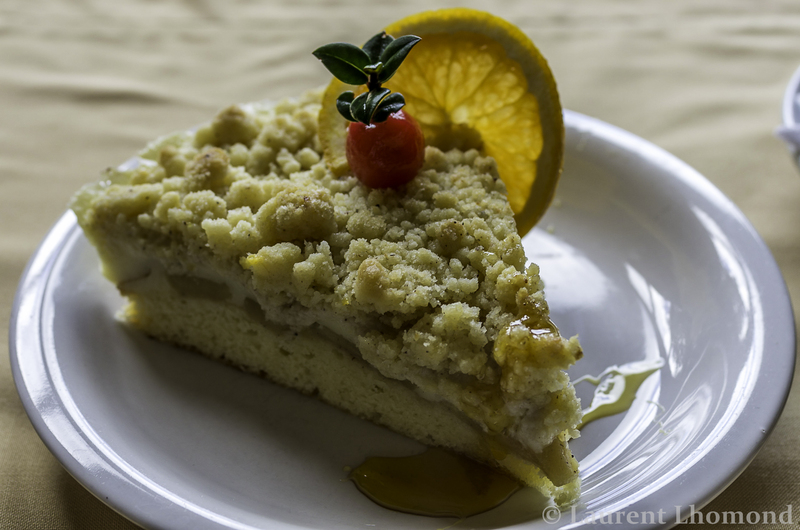 The most notable choice is a little bit of heaven known as the salteña. 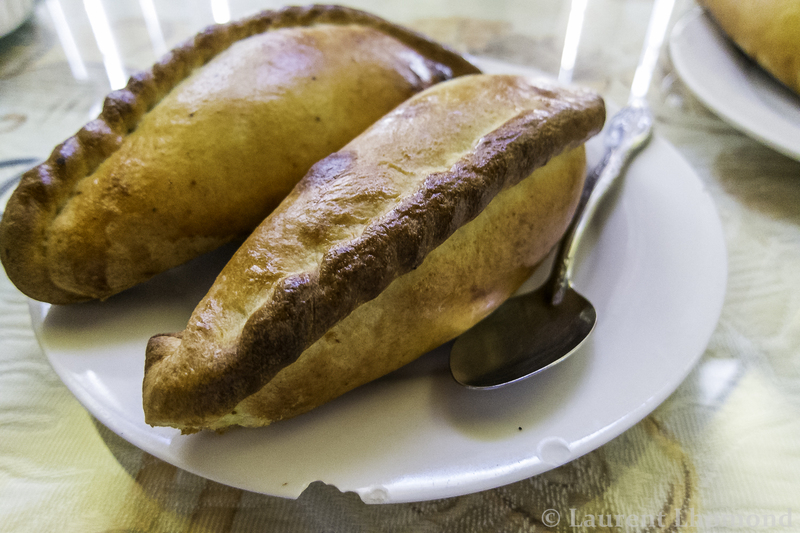 A salteña is similar to an empanada but the dough is sweet. The filling is savory, loose and saucy meaning that you will probably spill it all over your shirt the first time you eat one. But it’s worth it. I crave those little pockets of heaven! Typical fillings include beef and chicken but there are others too. Even though you are likely to get offered eggs at a hostel in Bolivia, in addition to the usual suspects of butter, jam and maybe even a stray banana or papaya (! ), Bolivians do not typically eat eggs. On menus in restaurants, this egg option is called ‘Americano’. They offer fried or scrambled but the latter come out resembling little pellets (like peas). I’m not sure how they get them like this (I actually attempted to recreate it to no avail) but it was a common sighting in hostels across Bolivia. Still, I was grateful for the protein. So what do Bolivians eat? Some eat bread with jam and butter or meat on bread. 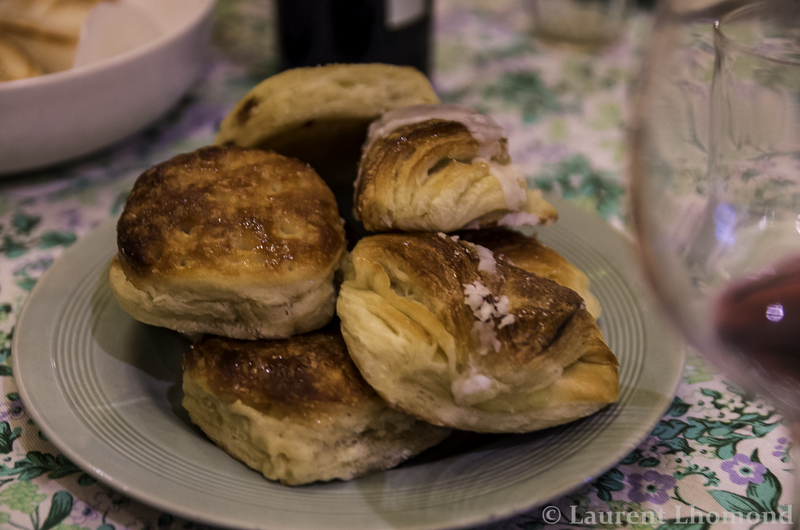 The bread in La Paz is the best bread we had in Bolivia. Known as marraqueta Paceña, like in Chile-it is also hero shaped (smaller like a club roll). But the version in Bolivia we found to be superior due to its often crunchy outer layer (the Chilean one is much softer). You’ll see people up very early at the local panaderias walking home with bagfuls of these small hero-like rolls. If you wander into the markets early in the morning, you’ll see the local campesinos (farmers) munching on fried pastries and see big stainless steel pots of of a purple liquid known as api brewing. The proper name is api morado and it’s so named because it’s made from purple corn (morado). They boil the corn in water along with sugar and cinnamon resulting in a thick, hearty, sweet beverage that gets ladled into glasses for purchase. Sometimes it’s made with white corn and is known as api blanco. Oatmeal known as avena is made into a hot beverage and is another favored choice. Another notable thing we found while traveling, is that when we visited smaller cities like Guanay, for example, we were offered up an entire chicken, rice and potato plate for breakfast. We were served coffee or tea with this, which I guess made it more breakfast-like? Not sure about that. The chicken platter is usually reserved for lunch time but in small towns where many of the workers are farmers, a more substantial, lunch-like plate is offered. Chances are high that you will not be offered this in your hostel. The fried pastries served with the api are filled with cheese and are huge. Known as pastels, they are of the same ilk as the kind you find in Brazil (this means they are deliciously and dangerously addicting). Some menus will list them simply as cheese empanadas. Often they are sprinkled with powdered sugar and served alongside the api for breakfast. Buñuelos (a type of donut) are also offered sometimes. Deep fried dough with a hole in the middle but thinner than a typical donut. These are NOT the same buñuelos you find in Peru or Colombia. juice stands are plentiful, healthy, cheap and delicious! 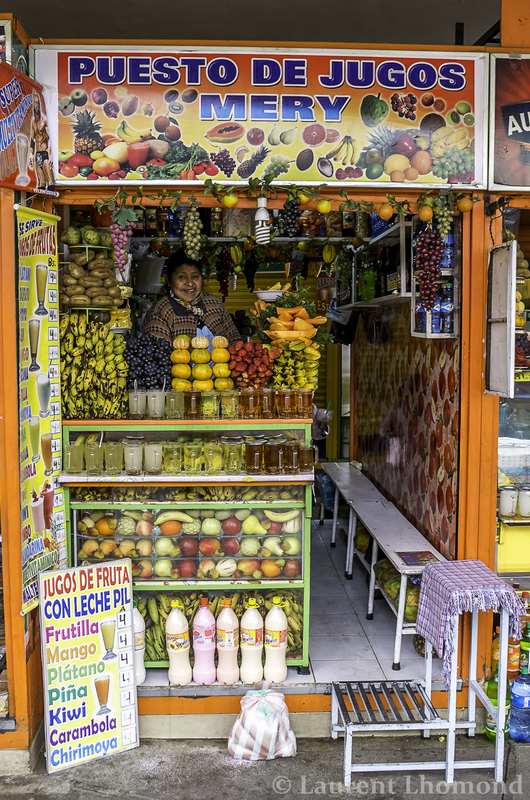 Another great thing about Bolivia is the juice stands. Located in every town and city in the markets, you will find colorful stalls with ladies lined up beckoning to you to come try their fresh blended juices. All the fruits are fresh, delicious and blended up right in front of you. You have your choice of getting it mixed with milk or water (be sure to make sure it’s purified first-it usually is though). 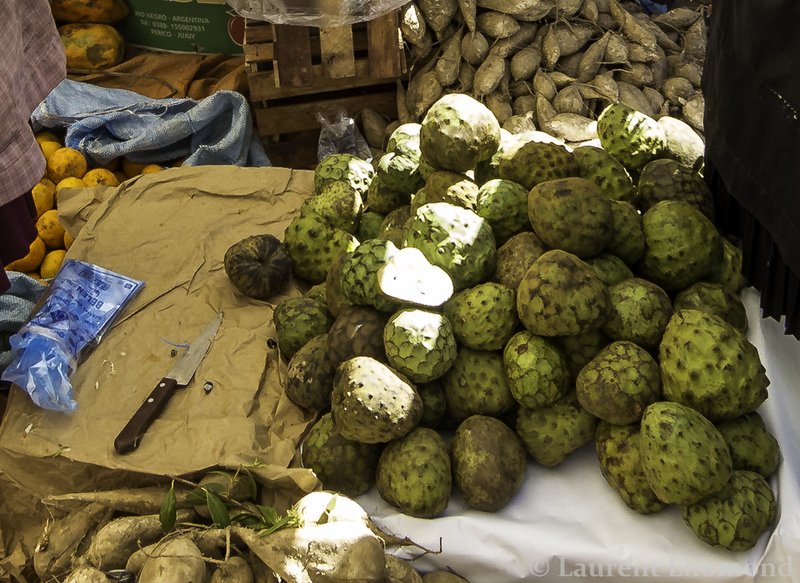 It’s a great chance to try fruits you never had before like the popular cherimoya. For just a pressed juice like carrot or orange, simply ask for a ‘zumo’. Every plaza in Bolivia has women pressing fresh orange, mandarin or grapefruit juice. Best part is that all of these juices cost less than a dollar and will probably be one of the best ones you ever had in your life! Summary: In hostels you will usually find eggs made to order, bread (the best are those crusty french breads in La Paz), butter and jam. Sometimes you will be lucky with a banana or orange to eat too. Fresh squeezed orange juice is also normal to have and bad coffee or instant. At home, Bolivians typically take a coffee (some with milk), bread with meat or with jam and butter. Campesinos and people visiting the market can be seen eating fried pastries, drinking api or eating a full on chicken, rice and potato meal. Stay tuned for Part 2 where I’ll be talking about the breakfast in Peru, Colombia, Brazil and Ecuador! Thanks for the trip down memory lane for me. I miss my Bolivian breakfasts! But no mention of coca tea? I found tea bags or loose leaves on offer at every hostel. I was also just as disappointed as you were in Argentina – at the first place we stayed, I thought they were serving us stale bread, but then at subsequent places I realized that was the norm and decided to skip breakfast altogether. Wow, I forgot the coca tea!! It was surprised to find it even offered in low lying areas too. I’m going to add it in now-thanks for the reminder! You’re right-I saw it at all the hostels. Breakfast really just seems an afterthought in Argentina. They have the worst breakfast, toilet paper and napkins!! Lucky the country & people are so beautiful and they had so many other ‘bests’ to make up for it! I don’t blame you for skipping the breakfast there!